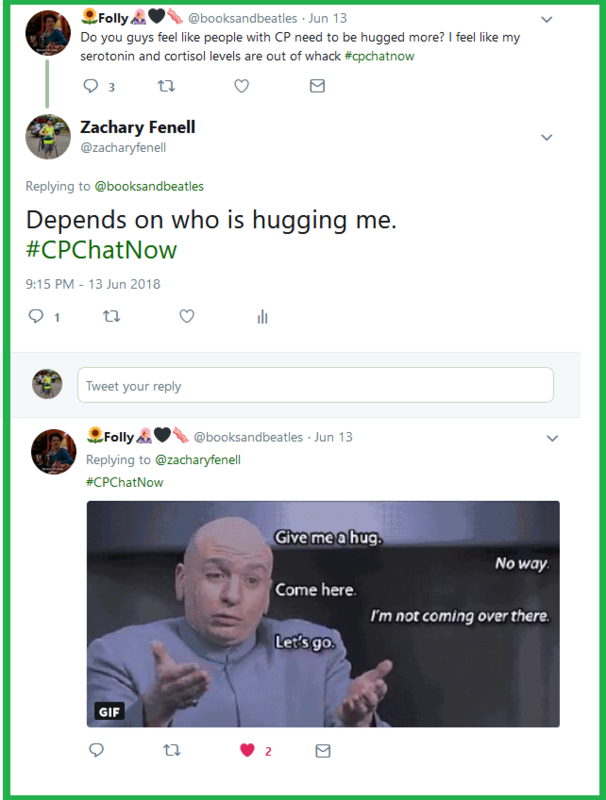 #CPChatNow was brisk this past week. Members discussed competing as a Paralympic athlete, baby announcements, stubbornness, and the difficulty of trying to convince others to use mobility devices. 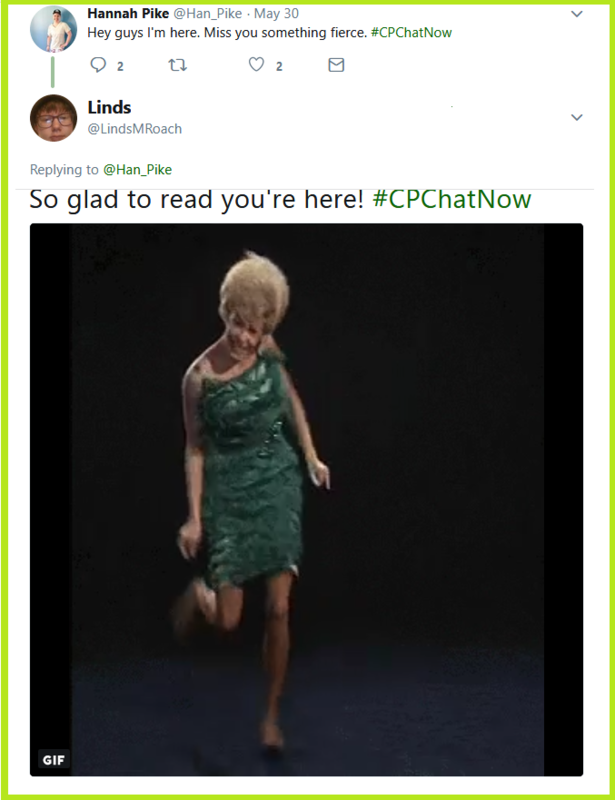 This is #CPChatNow Co-Host, Devin Axtman, taking you along for the ride on this week’s recap. First, we’re starting the recap with some happy news! The creator of #CPChatNow, Tim Wambach, from Handicap This just welcomed a baby girl. Congrats Tim! Also, #CPChatNow welcomed a new member in Ayden Jent. Ayden is a Paralympian, two-time World Championship US team member, and Para Pan-Am silver medalist. This brings us to our extend-the-conversation question: What has been your toughest form of disability related adjustment? Please share your answer in the comments! 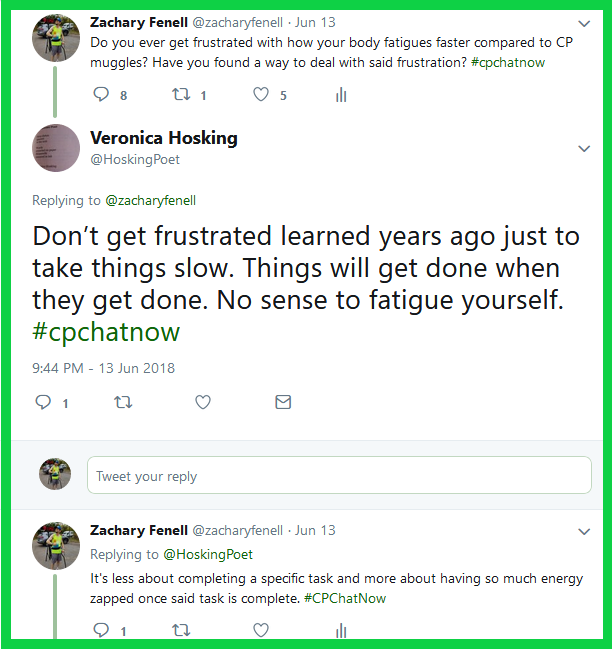 Discussion proved quite active Wednesday, June 13th, 2018 for our live weekly cerebral palsy Twitter chat #CPChatNow. I am co-host Zachary Fenell here with some highlights. Cue the screenshot reel! Early on multiple participants mentioned increasing physical activity. A subject initially raised when regular Folly noted her goal to improve her posture. I shared I too recently completed research, looking to add more variety to my current exercise routines. 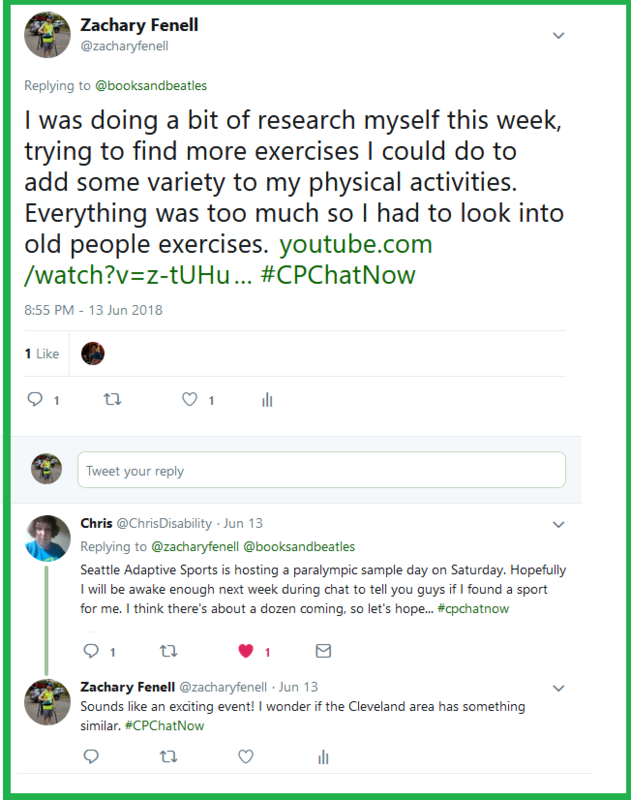 Meanwhile Chris expressed her interest in attending an upcoming Paralympic sample day hosted by Seattle Adaptive Sports. Enough movement and you can expect to grow tired. Fittingly that topic also surfaced within the chat June 13th, 2018. The cerebral palsy community’s tendency to fatigue faster compared to our able-bodied counterparts stood at my mind’s forefront, given a personal increase in activities. Therefore I asked if anyone else could relate and how they handle their frustrations. Folly offered various solutions including listening to music, counting in your head to distract yourself, and keeping your focus towards your breathing. She additionally named preventive measures, yoga and drinking water. Simultaneously participant Veronica Hosking interpreted my question differently. Leave a comment in the “Comments” section to answer. Who knows? Your response could provide the support someone reading needs. Essentially your reply possesses the chance to act as a supportive gesture, similar to a hug. Hugs actually became a concentration amidst the chatter. 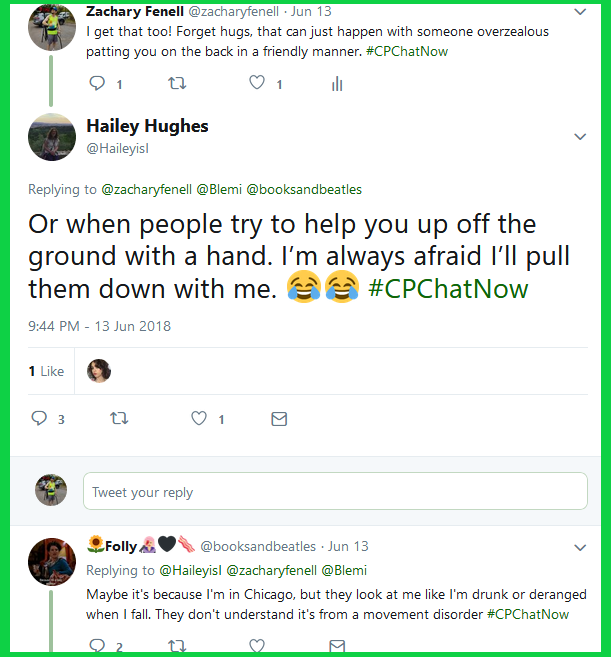 Originally Folly brought up hugging, pondering if people with CP need hugs more. I retorted saying the answer varies based off the hugger. Long-time regular Hannah Pike echoed those sentiments. Concurrently others identified a serious issue hugs may create. 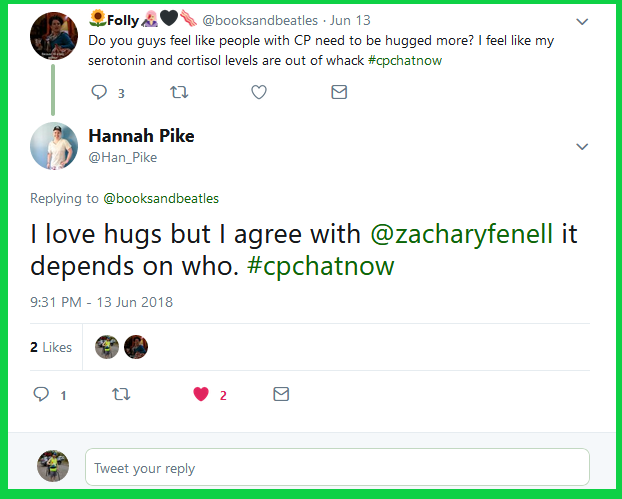 Hailey Hughes and my co-host Devin said hugs, particularly side and back hugs, can surprise them. This triggers jumpy behavior. Considering the balance challenges associated alongside CP, falls may result. The aforementioned transitioned the conversation to falling. Delving into details, Hailey and I chatted back and forth discussing falls. We agreed we become accustomed to our falls. However, add a bonfire or hot liquid to the situation and nerves heightened. Elsewhere in the chat, we gathered community feedback before finalizing our June 2018 Google Hangout date. That will happen THIS Thursday (June 21st, 2018). 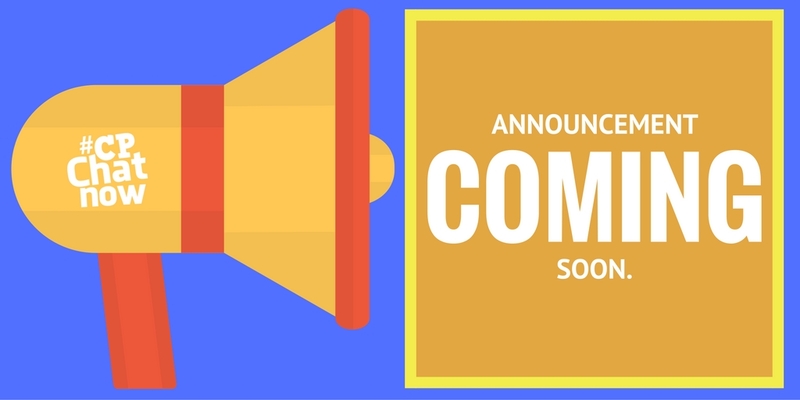 The link does not get sent out publicly. 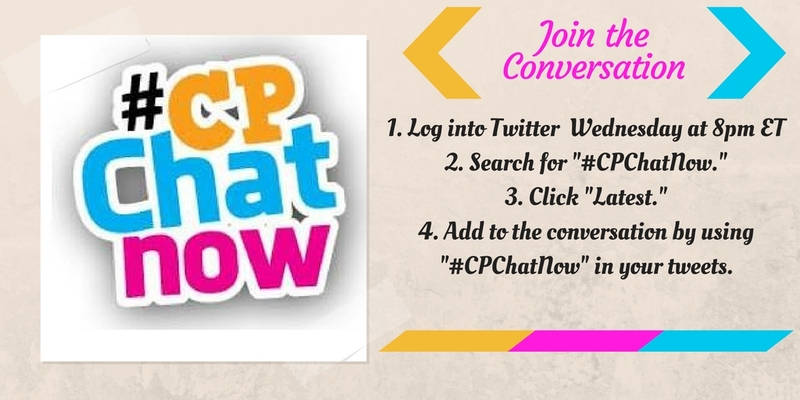 If you possess interest in joining the Hangout, send a message to our CPChatNow Facebook fan page. 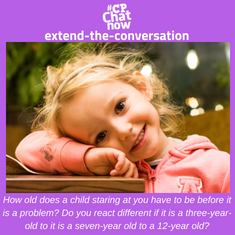 Before you go though, remember to answer the week’s extend-the-conversation question. 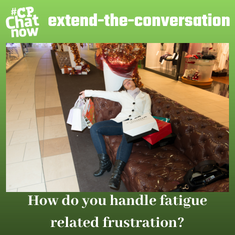 “How do you handle fatigue related frustration?” Reply below in the “Comments” section. 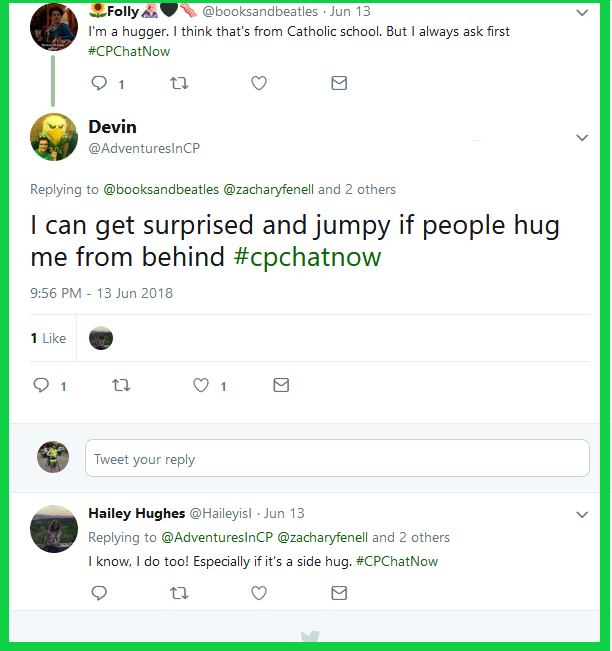 #CPChatNow was chipper this past week as members talked about things such as teaching their friends, what they would like their legacy to be, and whether they prefer moving or sitting activities. 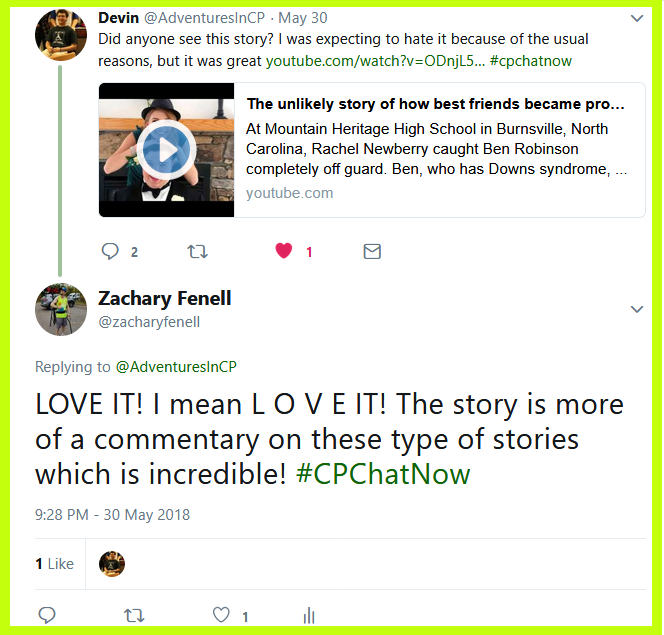 This is #CPChatNow Co-Host, Devin Axtman, taking you along for the ride on this week’s recap. 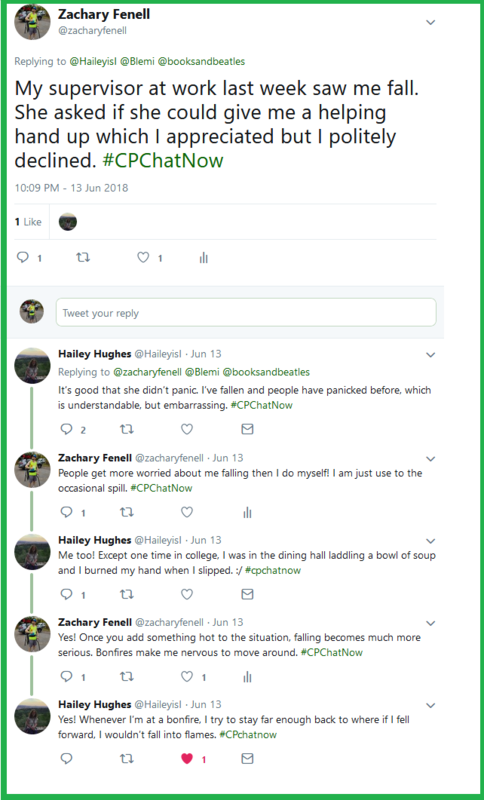 First, #CPChatNow would like to note the passing of someone who meant a lot to many in the cerebral palsy community, Dr. Karen Pape. Dr. Pape was a clinical neuroscientist and author. You can find her TED Talk here. 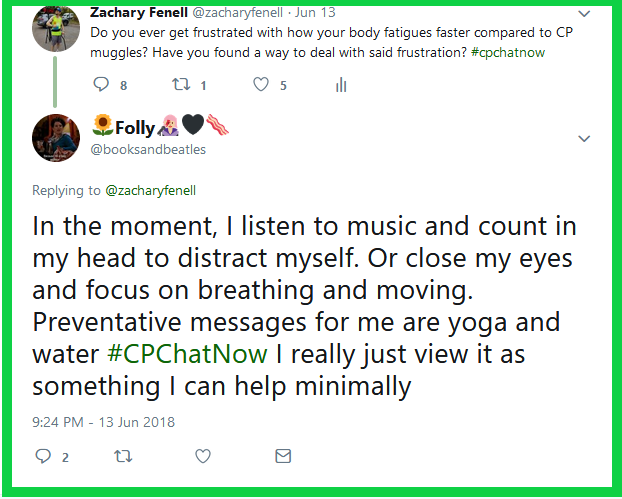 She also did a focus chat for #CPChatNow. You can find the recap for the focus chat here. Next, Amanda shared a story of a friend helping a man using a walker leave a restaurant. This is a great example of knowledge of disability expanding knowledge and empathy. Continuing the widespread dialogue, members talked about whether they prefer activities that involve movement or activities that involve sitting. The consensus was movement, but that a balance was necessary to prevent overwhelming fatigue. Hot showers were a favorite as well. This brings us to our extend-the-conversation question: What are your go to activities to get moving? Please share your answers in the comments! 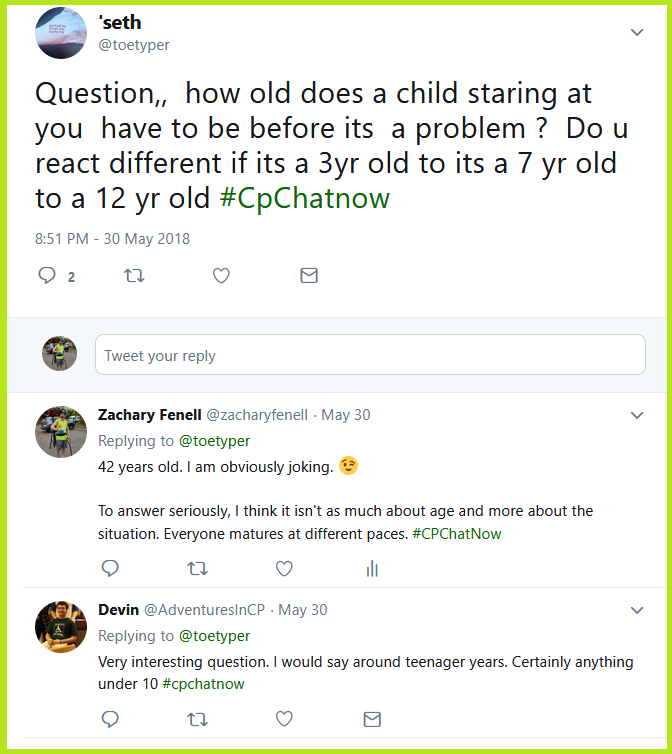 Resembling a box filled with chocolates, the live weekly cerebral palsy Twitter chat #CPChatNow featured quite the variety Wednesday, May 30th, 2018. To keep the analogy going, that makes me, co-host Zachary Fenell, (insert your favorite chocolatier here). So shall we explore the deliciousness embodied by Wednesday’s discussion? One endearing characteristic our weekly chat possesses involves the welcoming community. Participants can come and go due to life’s hurdles. Once cleared though, you can count on a warm greeting back. Just ask Hannah Pike and Yasmin! Fellow regular Linds greeted Hannah using a fun dancing GIF. Meanwhile both my co-host Devin and I expressed our excitement to see Yasmin again. 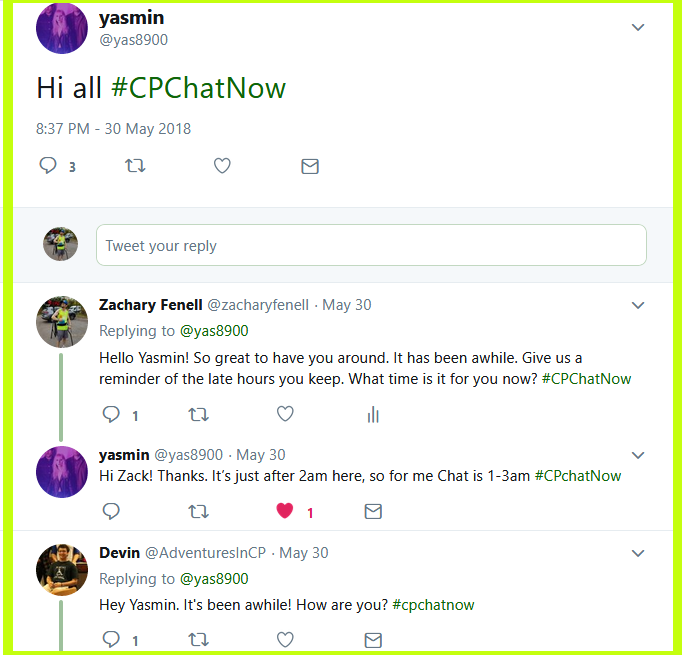 Yasmin’s presence represents a dedication towards our chat considering in her time zone #CPChatNow happens at 1am! Shortly following the salutations conversation garnered greater substance. Devin’s extend-the-conversation question from the previous recap surfaced as a topic. 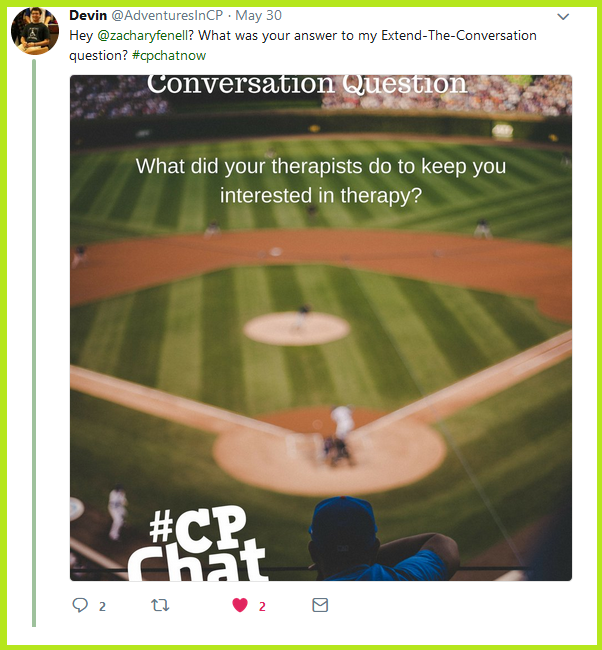 Earlier in the day I teased an interesting answer to the extend-the-conversation question Devin posed.The question asked “What did your therapists do to keep you interested in therapy?” Hannah and I each gave our answers. 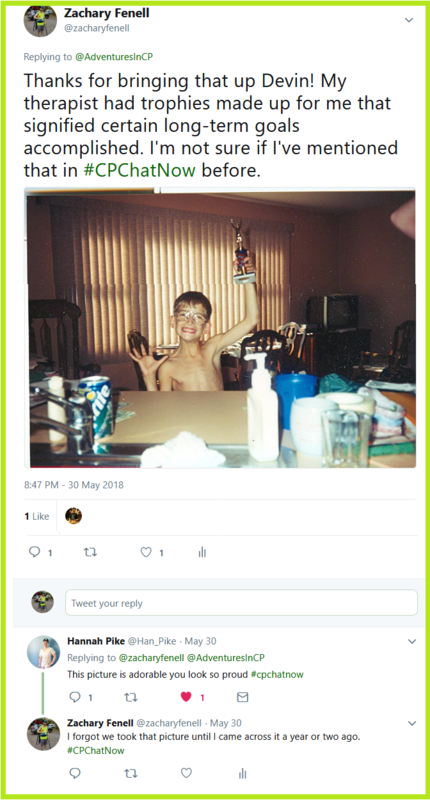 I shared my physical therapist awarded me trophies to commemorate achieving long-term goals. 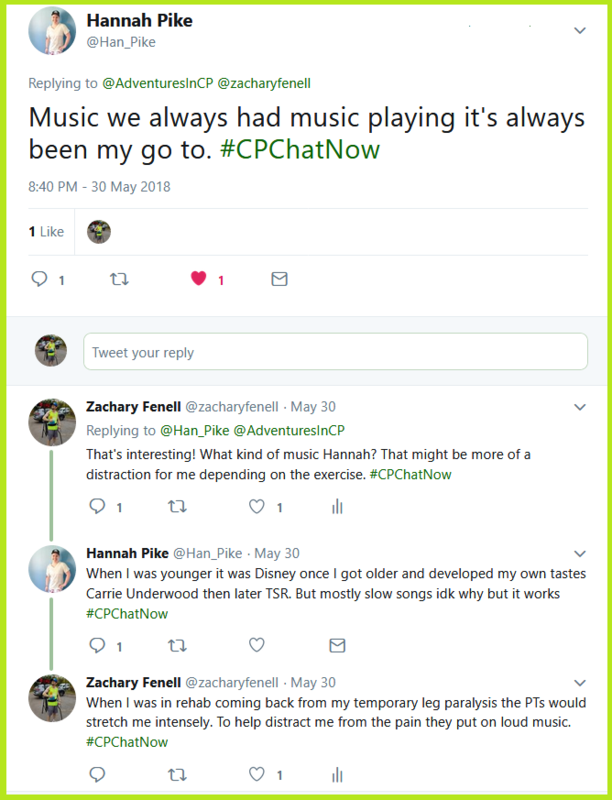 Hannah recalled her therapists letting her listen to music. The answer intrigued me because I remember therapists using music to distract me amidst intense stretching. Later in the evening Devin added to the evening’s assorted dialogue, tweeting a current news story. The aforementioned story detailed two friends going to prom together. Nonetheless rather than taking a patronizing or pitiful tone, the item broke the usual prom story mold. View and judge yourself. Keeping the interesting subject matters flowing, regular participant Seth asked a compelling question. Giving an ambiguous reply, I responded saying the situation matters more oppose to age. After all, everyone matures differently! Devin said stares become a problem once kids reach their teenage years. What do you think? Answer Seth’s question as the week’s extend-the-conversation question. Comment below to reply. Until next time remember, do not blend in. Blend out!